My official time was 4.54, and I was 461st. Beachy Head Marathon: puir bliddy swaddies are weary. The title is from Hamish Henderson's 51st Highland Division's Farewell to Sicily, to the tune Farewell To The Creeks, which a piper played today as we ran past him, a little way after the start. The conditions were not as bad as expected, for the promised rain didn't arrive, though there was a stiff wind and the mud in the low-lying areas was nowhere near as bad as I had feared. My knee did not let me down. My time was five minutes slower than last year, but under the circumstances, that is to say the disruption to my training, I'm not too disappointed. A short run in Stanmer Park with Claire, Jana, Joanna and Steffi. I fell beforehand and hurt my knee, which is stiff and sore, but I think will last tomorrow. Two days till Beachy Head. I ran the High and Over route in a brisk wind, but in reverse, so leaving Seaford on the Alfriston Road, up to High and Over and back alongside the golf club. For my first run after the Jog Shop Jog, I went for three ten minute fast runs with three minutes recoveries in between, and the usual ten minute warm up and cool down. It was hard work and I wasn't very fast, but I dare say it did some good. Photos for the Jog Shop Jog are now out, but no official times yet. Today I ran, for the last long run before Beachy Head, the Jog Shop Jog, an agreeably challenging twenty miles over the downs, including pleasures such as the North Face, the Big W, Death Valley and the Snake. I completed it in a decent time, which was especially satisfying as my history with this race in unimpressive: in 2004 I finished, but had to walk the last third of the course, and in 2005 I was pulled up after the Big W, both times because of knee trouble. This time I had no such trouble, and finished well for me in around 3:25 (some doubt about this as the Forerunner didn't find a signal at the start, which is underneath a fly-over. 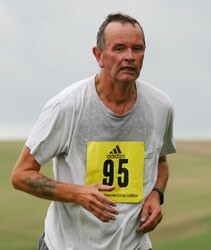 Two weeks till the Beachy Head Marathon. Now the taper starts. The Jog Shop 20 (or Hog Shop 20 as it has become known among my running circle) takes place on Sunday, so with fellow entrant Claire (and also with Jana, who has more sense) I ran a short run in Stanmer Park in gorgeous sunshine.